the sea hole | The Ego Co.
Ego Co. Bloggers, Events, Naminaeko Resident, The Costume Ball, The Ego. Co.
A Costume Ball or the Walking Dead? Ahhh, this is my first ever blog post here on the Eco. Co! I Excitement yes yes 😀 I’m so honored to be apart of this blogger family, a great, very talented group we’ve got here! Anywhooo, soooooo Halloween is soon, as most of you know, and, well, it’s about time I put on something creepy. 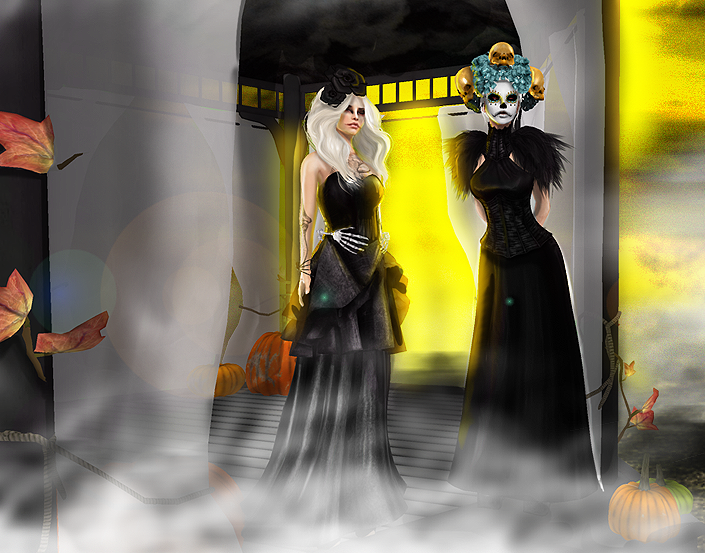 I enlisted the help of my two closest sl friends to bring you a huge range of glam, elegant, creepie, and beautiful walking dead looks! Natalee Oodles (owner of StyleMinions.com, and creator of the soon to open Noodles) and Celeste Jim Forwzy (Blogger for StyleMinions.com and creator of “Jim” ) are my two gorgeous models in the pictures to follow, and they each brought to this little post a great deal of their own style. Many of the pieces here are also new Halloween edition items and pieces from The Costume Ball Event going on til the 1st of November, so here over to get your items! For the most part, the looks are some sort of zombie, glamorous dead women. It was something that just happened, and wasn’t planned. I’m know for my crazy out there style, and this was a chance to really rein that in and try to be beautiful but hauntingly scary at the same time! I hope you guys really enjoy this post, it was tons of fun to do and edit. Thank you my wonderful readers for sticking with me so far, many more Halloween and crazy posts to come! Also Blogged here. Furnature set: .:SF:. 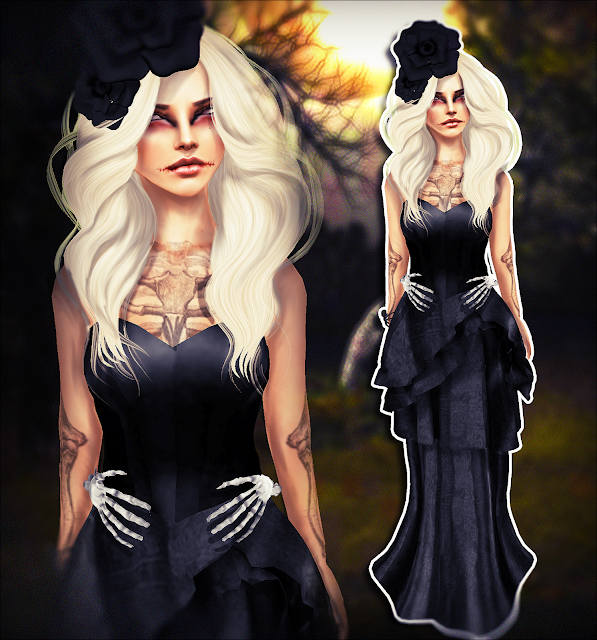 “Nevermore” Dark Parlour Set , (The Costume Ball Event) NEW! Hair: *Alice Project* Steph II [S] – Infinity (Zodiac: Scorpio Event) NEW! Shoes: Ingenue :: Scorpius :: Water (Zodiac: Scorpio Event) NEW! Necklace: lassitude & ennui Scorpio key necklace – gold / red (Zodiac: Scorpio Event) NEW! Dress: [Haste] Costume Ball Dress (The Costume Ball Event) NEW! Eyes: Clemmm – The Whites. Shoes: .:Eclair:. Hellbound Platform Boot. Skull Makeup: Shakeup! – Catrina Makeup A. (The Costume Ball Event) NEW! 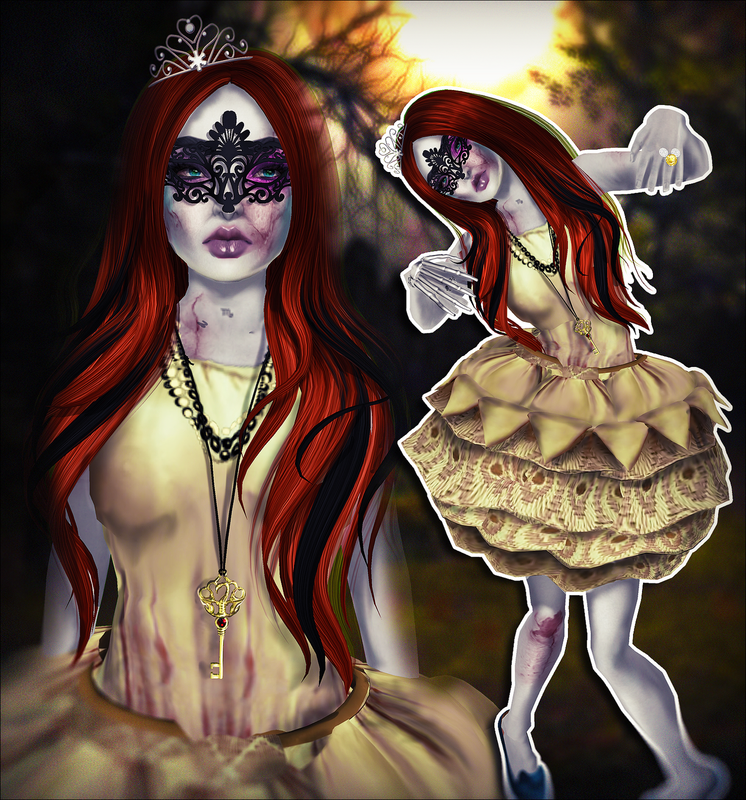 Dress: Happy Undead – Black Widow Dress (XXS big) (The Costume Ball Event) NEW!